How I quickly installed Django on Ubuntu 14.04. You may want to follow these steps to very quickly get your hands wet with Django. Here’s how I did it creating the simplest possible setup. I began with a fresh install of Ubuntu Server 14.04 without Apache or Mysql. 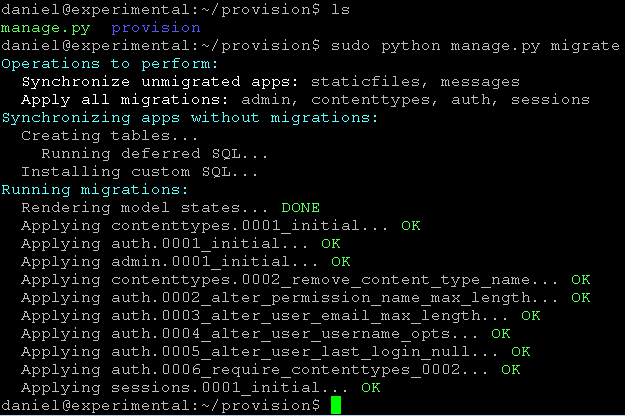 Since Django is python based you will of course need python which I installed first using the following commands. which returned a success message. With Django installed I created my first project with the following command. I will be using this project to help provision some Polycom phones so I decided to call the project “provision”. Use whatever project name you like. Wherever you type the following command is where the project will be installed. It is highly recommended not to install the project in your web root folder as you want to keep these project files which will contain your code hidden. I installed my first project in /home/user. Since I need to access my experimental server from another machine on the local network I used 0.0.0.0 as the IP and chose 8002 as the port. Leave the ip and port credentials out entirely if you are accessing the server from the local host. going to MyServersIP:8002 on any computer in my local network takes me here. Yay! Now you can continue writing your first Django project following their extremely well written tutorial HERE.